﻿Are you on a network with limited access? Is someone filtering your internet traffic, limiting your abilities? 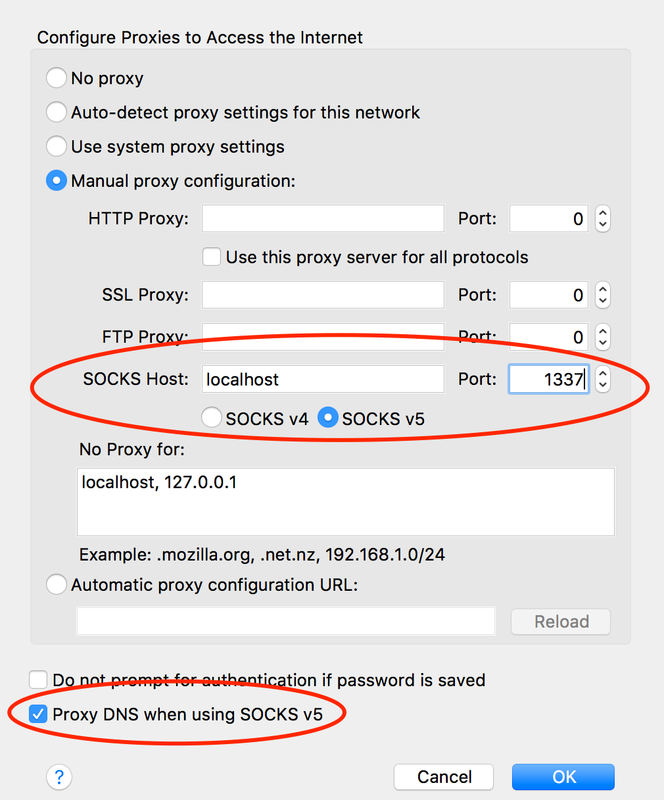 Well, if you have SSH access to any server, you can probably set up your own SOCKS5 proxy and tunnel all your traffic over SSH. Visit any "what is my IP" website and refresh the page before and after your SOCKS proxy configuration. Except when one already multiplexes one’s SSH connections by default. Ooh, that’s a nice trick – didn’t know that. Thanks! will this work if ssl/ssh packet inspection enabled in firewall ? $ google-chrome -proxy-server="socks5://127.0.0.1:8080" --host-resolver-rule="MAP * 0.0.0.0, EXCLUDE 127.0.0.1:8080"
$ open -a /Applications/Google Chrome.app --args --proxy-server="socks5://127.0.0.1:8080" --host-resolver-rule="MAP * 0.0.0.0, EXCLUDE 127.0.0.1:8080"
Yes, you’re using the SSH protocol to encapsulate all your packets. It’s not a “hack” on SSH, it’s a built-in feature, so it should pass through any DPI firewalls. In fact even a basic proxy is able to detect this kind of beakout. To also hide the fact that you are using SSH to tunnel one could create a OpenVPN tunnel over port 443. SInce openVPN uses the same Negotiation as HTTPS it would be impractical to to dectect this traffic as non HTTPS traffic. That said a PaloAlto is still able to fingerprint SSL based traffic and filter HTTPS from other SSL stuff. On host using DHCP networking without use of any DNS protection method (DNSCrypt or external DNS such as OpenDNS, Google, Comodo), on QEMU/KVM virtualisation platform, a remote connection using free non-privileged ports which can be forwarded by non-root users, such as ports 1080 and 1337 (ssh -D 1080 -fqCN user@) is established between the Linux guests which are for their part connected to a bridged network interface (192.168.0.0/24). Result from testing DNS leakage regarding that created SOCKS5 proxy revealed that client’s public IPv4 address that, as understood here, should change to the one of the remote SSH server, remains the same as the one without the use of proxy, which is itself the public address of the host; that seems to me expectable. Or could that be then interpreted as a relevant sign for indicating that the ISP is using a technology called ‘Transparent DNS proxy’. which intercepts all DNS lookup requests (TCP/UDP port 53) and forces the user to use ISP’s DNS service for all DNS lookups In that condition, changing the DNS settings to use an ‘open’ DNS service would not be helpful. You are in terminal session to the remote server, so, why you don’t use localhost instead of server name in SSH command? The file /Users/USERNAME/Chrome.app does not exist. On Linux Ubuntu, I am unable to get this to work. Is there an extra step to take if I need to browse to a port of say localhost:3000 ? could you use the chorme extension https://chrome.google.com/webstore/detail/secure-shell-app/pnhechapfaindjhompbnflcldabbghjo?hl=en to establish a SSH connection with SSH arguments at the bottom of the extension -D 1337 -C -q. This way you don’t have to rely on putty or mac terminal to establish a connection but do it all within chrome?